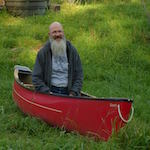 Canadian Canoe Routes • View topic - Solo Run of the French in May? Post subject: Solo Run of the French in May? I'm looking at maps and thinking about Spring [solo] trips, and one option on my short list is a leisurely run of the French, from the islands on Lake Nipissing, on down to Georgian Bay & then looping back to Hartley Bay Marina or some other access point (and pay for a car shuttle). I measure my trips by the days out and not by the distance traveled. My hips are degrading so I'm slow on the portages. I also enjoy photography and I don't need to hurry. I would probably take my Royalex Swift Raven, with a spray deck, and mostly pack in barrels. I have a new canoe dog. She is a work in progress & was on her first canoe trip last summer (14 days in the islands off of Philip Edward Islands and the French River "delta" late last summer). I have a dry suit & we will both, of course, will have PFDs. Does anyone know what kind of water conditions (and black fly conditions) we can expect? I like to squeeze in a trip between ice out and black fly season. I'm not keen on paddling whitewater with ice in the flow, and I'm not keen on nursing a dog that's been savaged by the flies (dry suits make awesome bug suits - but she doesn't have one). What will the character of the whitewater be at that time of year? If we swim in ww, are we likely to be able to find places downstream to exit the water? I know some sections of the French have fairly long stretches of steep rock shorelines. Thanks much for your comments and insights. Post subject: Re: Solo Run of the French in May? Water level in the French is determined by dams at the outlet of Lake Nipissing... the dams are managed to moderate lake and river level fluctuations and with the lower inflows to Nipissing during the winter, spring runoff may be held back at the dams to raise the level of the lake back to where it should be, esp if it is a low snowpack winter. Spring water levels in the river may not fluctuate as much as in an undammed system, still, it must depend on how much snowmelt is there to raise the level of the lake. Will answer black fly question. Before may 14 you should be good...sometimes they are coming out but often not biting. After may 21 it will almost certainly be bad unless on cold days. Between the two dates...depends on the spring. I live an hour away and work often in the woods so but situation is often top of mind. I'm most familiar with the section around 18 Mile Island and have done that section numerous times from spring to fall. Spring water levels have not been daunting any time I've done it. I have done the entire length from North Bay to Georgian Bay and then down to Midland once many years ago. That trip was in July and if memory serves I didn't have to do any portages but that will depend on your skill and comfort level in WW plus you'll probably err on the side of caution traveling solo. I don't think you'd have any problems recovering a short distance downstream if you wound up swimming in the rapids. Depending on weather, the black flies can be annoying but you might get lucky. You want an easy route? The Mattawa. Between North Bay and Mattawa, it is about 30 km, and takes up to 3 days. There are about 5 portages, with the one at Talon Chutes as being the worst. At that time of year, all the rapids are either runable, or line-able. I've paddled a conservative 1000 miles on the French (most of that as a guide) and I'd say there's no way to do this without a couple of portages. Just one example of obstacles would be either Recollet Falls (not really runnable in an open decked canoe at any time) or Little French Rapids (either a dry rock bed or a raging torrent) on either side of Fourteen Mile Island, or Horseshoe Falls (which ain't do-able). With that said, if you're comfortable in a few rapids you can go the length of the French with relatively few portages for sure! Solo, I'd be portaging several places that I would be running tandem. I've never been there in May (June 1 was the earliest), and it's honestly a more favorable paddle in higher water.